Cremyll Keelboats (CKB) is a trading name of Eyemouth International Sailing Craft Association (EISCA). The operators, Dominic and Barbara Bridgman, moved in the old Cremyll Ship Yard, also known as Mashfords, in 2005. The boatyard is set in the grounds of the Mount Edgcumbe Estate, on the Cornish shores of the Hamoaze just opposite Plymouth. The operators manage a small part of the EISCA collection, namely the Flying 30’ “Huff of Arklow”, a range of small boats such as Fireflies, a dinky and a duckling and five 22 square metre class keelboats. 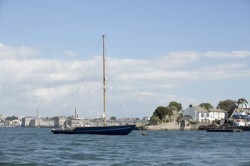 During the years, the focus of the operation changed from intensive sail training with the 1906 Falmouth yawl “Moosk” to the restoration and establishment of a 22 square metre keelboat club and the restoration of the Uffa Fox Flying 30’ “Huff of Arklow”. The latter was restored during a five-year period, mainly through the work of apprentices and volunteers supervised by Dominic Bridgman. The project was awarded grants by HLF, WCS, TT and NHSUK and it was possible to establish an apprenticeship scheme around the project thanks to the support of the Skills Active Agency and Falmouth Marine School. Nowadays CKB provides a series of educational services and activities from its base in Mashfords. Through the provision of training in seamanship skills and boat repair & maintenance, the students and trainees acquire the knowledge required to increase one’s self-confidence, make independent assessment and deliver self-contained management. CKB provides a communal place for maritime enthusiasts and craftsmen, of any age, to come and share their skills and knowledge, a place where young trainees can learn from the experienced ones and be exposed to a realistic working environment encompassing boats of any size and shape, commercial slipways, heavy duty machineries and a range of workshops dedicated to each skill required in a commercial boatyard. CKB is RYA training school that covers the National Keelboat Scheme and the Sail Cruising syllabus with a particular focus on young skipper training, both theory and practice, to include wooden boat maintenance and repair, rigging skills and boat management. An excellent way to brush up or learn new techniques is through the “Work Experience Courses” for students of all ages, to learn in a relaxed atmosphere the fundamental elements of boat maintenance and repairs, seamanship and sailing skills, traditional hulls and rigs, basic and advanced navigation theory and practical boat manoeuvres under sail and engine.